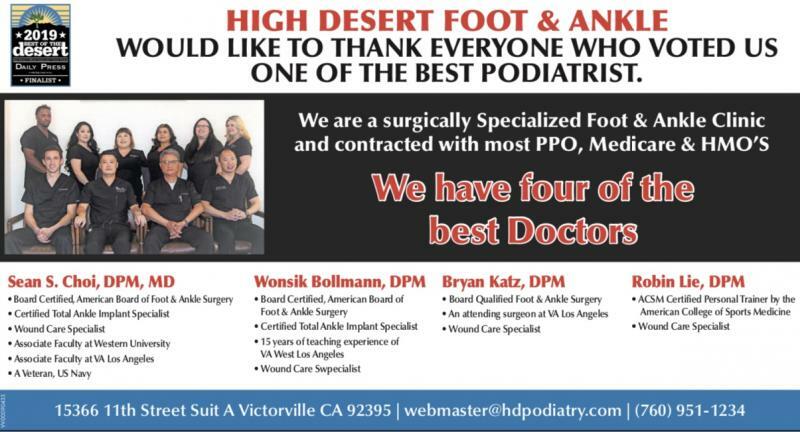 High Desert Foot & Ankle Clinic - Voted Best of The Desert!Click here to see our reviews online! Voted Best of The Desert! Click here to see our reviews online! High Desert Foot And Ankle Clinic is the leading institute in treatment of foot and ankle problems in High Desert Area. Our doctors comprehensively treats all foot and ankle problems from simple hammer toes, bunions, heel pain, ankle sprains and fractures to the most complex reconstructive surgery including newest Total Ankle Implant (only available in entire High Desert Area) and limb salvage of the foot and ankle. Our doctors are highly surgery trained and have cutting edge technology, surgical experience and recognized in the area as expertise in foot and ankle surgery. We are dedicated to helping you walk better and have healthy feet. We treat people of all ages, from infants to geriatrics, treating any problem with the feet. Our doctors care about patients and their health more than anything else. You will feel welcomed and will be treated in a non-rushed and friendly environment.